A little over a week ago Wahoo Fitness released the Strava Segments app. It was ironically just shy of a year ago that I previewed the app at the time of the KICKR unveiling at Eurobike. Since then the app has received a bit of polish, as well as updating to minimize issues related to bad GPS data making it difficult to ride routes. In other words, it moved from an app that was developed literally over a weekend just in time for Eurobike, to one that’s sellable. Since I continue to receive a number of questions asking when the app will be ready, I figured I’d take a quick moment to walk through how the app works, as well as some thoughts on pricing (since it’s now released). 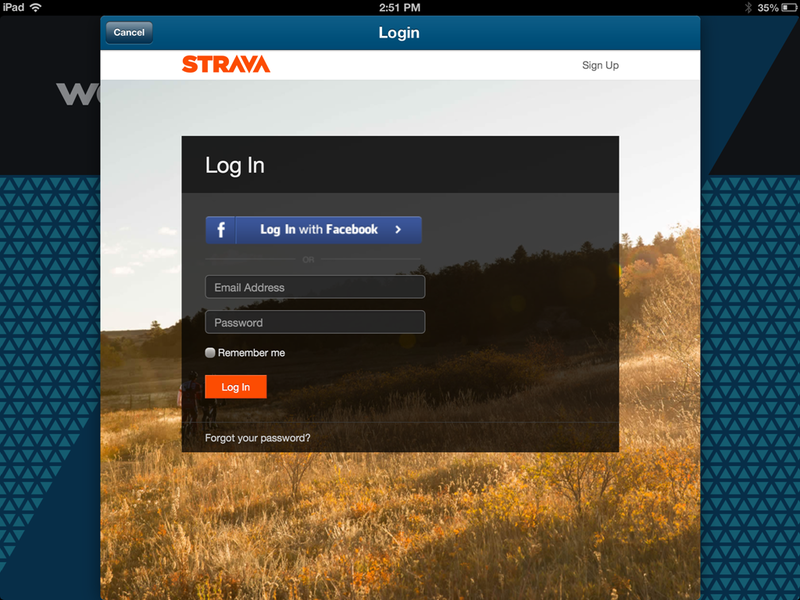 Upon starting it up for the first time you’ll need to authenticate with Strava. 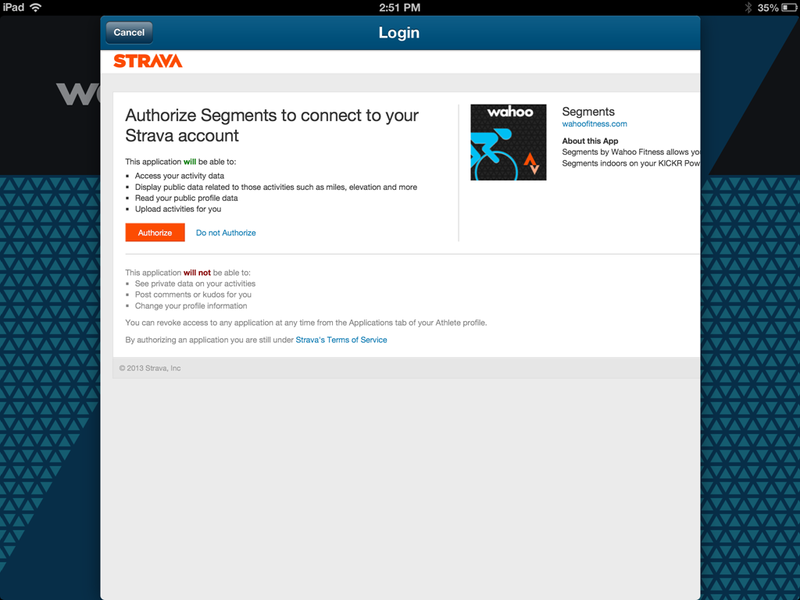 This allows the Segments app (which is made and sold by Wahoo Fitness, not by Strava, though it does has Strava’s blessing) to access your Strava account and pull your segment information. Once that’s completed, you’ll be brought to the main screen. This screen uses your current GPS location to enumerate segments in the area (as a starting point). You can use the search box in the upper corner to narrow it down to a specific address or area somewhere else in the world. Additionally, you can configure workout zones, triggers and and a few other settings here. Later on I’ll talk about sharing. With that done, go ahead and close it out. You can now start pedaling to get fully up to speed. Like in real life, you’ll want to start the segment with the highest possible speed, otherwise (especially for shortest segments), you’ll be behind the curve from the get-go. As you ride, the resistance is automatically controlled depending on the grade in that area. Wahoo has done some work to try and address issues with bad elevation data for a segment by introducing some smoothing that protects against that. However, I found that even on what are perfectly flat segments within the real world, I’m still seeing some variation in grade where there shouldn’t be. You’ll see the grade information displayed on the left side, along with other metrics. On the map you’ll see the person you’re racing against, as well as your position (dots). You’ll notice that the grade changed a few times. In this case the road is actually pancake flat – so as I was inclining, I was at a bit of a disadvantage in that the real-world person was going flat. And while there was ‘downhill’ segments in the recreation, the KICKR doesn’t drive the wheel forward, so these non-real downhill’s don’t really help. 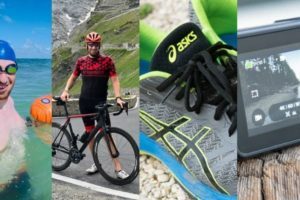 Once you’ve completed the segment, it’ll be saved – but not with segment information to Strava, rather, to a local cache of your previously ridden segments. Given the complexities in the real world (lights/cars/people/wind/etc…), it wouldn’t quite be fair to upload these there. Though, I wish there was a way for Strava to simply flag them as trainer segments and have them in a separate category. Over time I suspect apps like this will become more popular, and standards will be solidified in the coming months such that it won’t be only the KICKR that could use an app like this – but other trainers as well. Or, you can just e-mail yourself the TCX/FIT/PWX/CSV/etc… files too. The app isn’t free, but rather $15 for a short while, before jumping up to $30. At first glance, that may seem expensive for an iPad app – and in the realm of iPad apps, that’s pretty true. But, I think it’s also realistic. And more importantly, I think it allows developers to actually build pretty and well executed apps that can sustain themselves, rather than ugly and crappy apps that nobody wants. Ultimately, in the small segment that is the sports technology market (and even smaller segment of users that have the KICKR today), you simply couldn’t recoup development costs for a 99 cent app. Now, there’s debate about whether this app since it’s provided by Wahoo should be free since you already bought the KICKR from Wahoo. And I can see that. But I’d also like to see Wahoo focus on other software gaps in their lineup. And if that means that the Segments app proves to them that they can do that for a reasonable price, then I’d love to see what else they can develop. For example, looking at the KICKR software lineup today, there’s gaps in multiplayer (internet or studio), gaps in simply riding an existing course/route (i.e. a route you uploaded to Garmin Connect), or even the ability to stream your KICKR workout real-time to a site or to upload it to a Wahoo-focused site. All areas that I’d happily pay $15-$30 as a one-time fee to have. And that’s all before we talk Android or other platforms. Keeping in mind that most other software suites out there from CycleOps, Tacx, and Racermate (CompuTrainer) cost hundreds of dollars (though do deliver more). As it stands today, the price of $15 for the Segments App seems like a pretty good deal to me to be able to ride endless Strava segments. I do wish I could ride more than just a segment (for example, re-ride an entire route/ride), but for now, I’m content with what’s there. I’m optimistic they’ll continue to develop and update on it – just like any other product, and given last week’s update to the release, that seems to be the right direction. For example, I’d love to see basic RFLKT integration with it, allowing me to start/stop the workout from my handlebars as opposed to my iPad. As always, if you’ve got any questions – feel free to drop a note below. Will it let you ride private segments? Also, what’s to stop you from making an entire ride a segment? For the purpose of “riding an entire ride”, I mean? And on that note, it really seems like a very simple thing to change this to allow for riding entire rides and not just segments. Maybe I’m missing something on that one, but *that* app would be much more interesting to me than a segment riding app. I do agree, however, that this kind of software price point makes sense. I agree with Donnie, I don’t want to ride a 1-mile segment. It’s not worth the trouble to do a bunch of little segments. I would rather setup and do the whole ride and have the software indicate that a segment is coming up. Even the ability to set “laps” on a segment would be good. I could see wanting to do segments like intervals or loops, so the ability to do “segment A x (n) would be a nice add. you can indeed make your entire ride a segment.. I’ve done it many of times. Might be hard to find so make a note of the number and then you can search for it. Thanks for the overview. 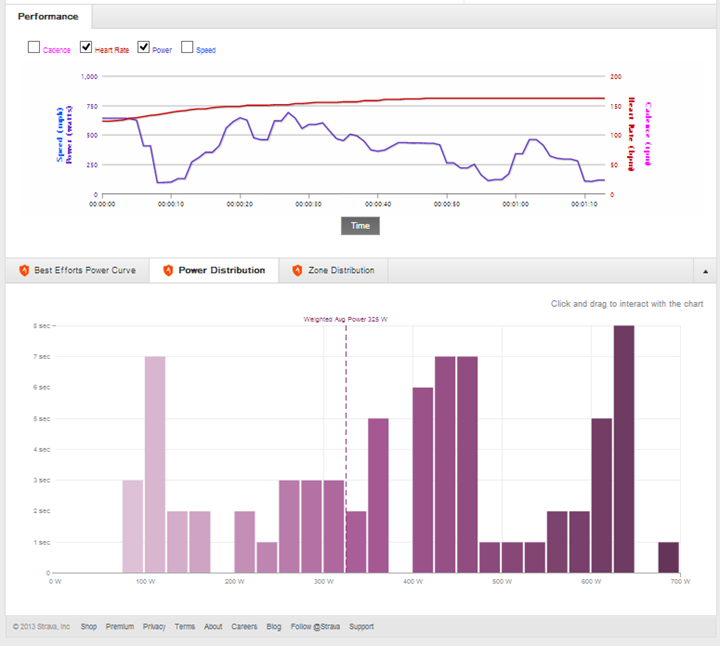 I have an ANT+ speed/cadence sensor (and HR monitor) that I’d like to use with this app. If I picked up the Viiiiiiiiiiiiva HR strap, would it bring my ANT+ data and the KICKR into my iPad (that has BTLE)? Alternatively, I could just get the 30 pin adapter + ant + key for my iPad, but I think the new HR strap is a cheaper option. Thanks for any insight that anyone can provide. The problem is that the Wahoo apps today don’t really understand the rotating Viiiiva strap piece, so you’d have data fidelity issues (blocky data). Check out Apple Store. I bought mine in the Norwegian Apple Store way cheaper than it would be to ship it from the states. We have stock in the uk and you can buy it directly from our website. Do you need Strava Premium for this? 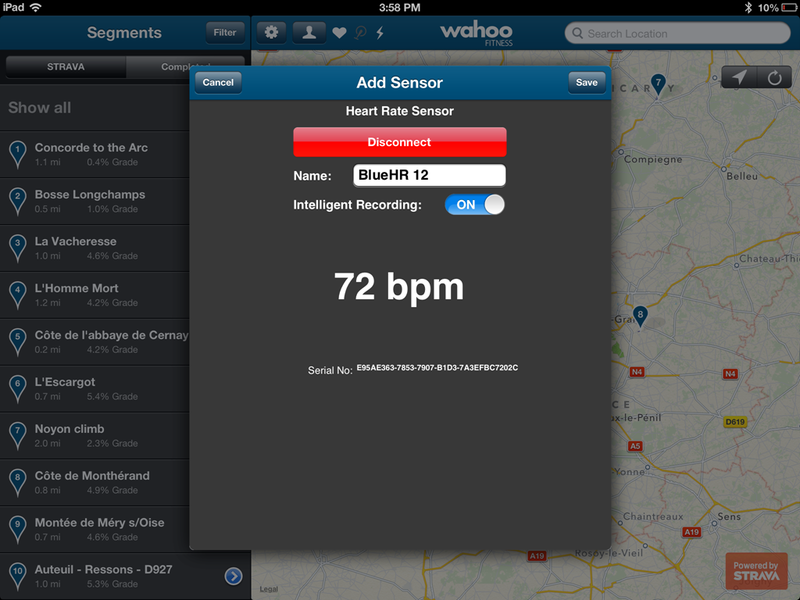 And does the app work with an older iPad (iPad 2) with ANT+ Sensor? You do not need Strava Premium, just the free Strava account. It does work with the iPad 2 but you would require an ANT+ sensor to connect to both the KICKR and your other ANT+ sensors (Speed/Cadence and HR). My roommate got a KICKR on Friday and I bought the segments app as a small contribution to having an awesome trainer at my disposal. The app is very well done, and definitely worth it so far, but one thing that most reviews seem to miss is the very limited segment availability. I don’t have it in front of me, but I believe that for GA, there were only 20ish available segments out of the hundreds here, although it seem to include some of the most classics like Hogpen gap. There didn’t seem to be a pattern in what was available and what wasn’t. I don’t it had anything to do with popularity. I am extremely hopeful that these will continue to be built out, and more hopeful that the new Strava routes will make it in…or maybe mine is just messed up? Anyway, so far it is very cool and absolutely worth the $15, so I wasn’t too disappointed that a lot of segments weren’t there, but others may be. In reply to Ben, all segments should be available. From what I’ve read elsewhere the app only lists the top segments for the current map view, if the segment you’re looking for isn’t visible you need to zoom in closer and hit the refresh button or search for it by name. Received my own KICKR today but don’t yet own an iPad so can’t try the Segments app (though I did already buy it since it’s on sale, just waiting for the iPad mini to gain a retina display now). All the Segments are available. When we search a given map area, the top 10 segments are returned. This top 10 is generated from the Strava servers. Try using the grade filter and zooming into the area more. I’m working on a few around and will be my target for the next update. Hopefully we can work on some better filters and also allow users to enter the segment number directly, this is important for private segments. That is fantastic news. I guess I’m not as tech-savvy as I used to be. I played with it for a while and couldn’t figure it out. My apologies for piping up with bad information. In that case, if you have a KICKR and an ipad, you should buy this app. I saw something above about being able to do “Courses”. Is this correct? I had the app and returned it because I did not want to just do small segments when training for bigger events. I know this is an older post re Wahoo Segments App, but I can’t seem to get it in Australia. Has it been removed/replaced from the App Store? I assume mirroring to an Apple TV works. Rather than mounting the iPad, it would be awesome to be able to throw it up on the big screen. Assuming there’s no time limit or anything like that and you can ride these, you’ll have the ability to ride long rides/workouts using this app! Opens up all new possibilities. No doubt you can, but I find that somewhat inconvenient (really a PITA actually). I’d like to simply be able to pick out an entire route, and/or previous ride – and ride that ride. It’s one thing if for example you’ve got an ‘A’ race and you’re going to re-ride that course all winter long, but if I’m just browsing around on a random rainy winter day for a long ride, the ability to search for a given known course is important (and how it works on other platforms). Considering Strava recently introduced the concept of routes it’s hopefully just a matter of time until they appear in the Wahoo Segments app as well. The biggest problem with this is the quality of GPS data… Single Segments have corrected elevation profiles from data collected from many barometric altimeters. While it would be possible to access a full list of previous rides, for most people elevation data isn’t acceptable. Although it seems this isn’t something everyone else is worried about…. Ray, while I hesitated initially about the $15 price tag, I came to the same conclusion you did. Especially when I put it in the context of Kinomap and/or Trainerroad, whose monthly costs are similar to this one-time cost. I’ve emailed Wahoo customer service, but as an iPad2 user with the Wahoo ANT+ key, I’m having no luck getting the app to work. I’m able to get kinomap and the Wahoo Fitness app working just fine with that configuration, but the Segments app has a problem where it shows “–” for speed and power for about 8 out of every 10 seconds, making it very hard to actually ride a segment. Their customer service has acknowledged receiving the issue, but I’m not sure how quickly they’ll get a fix on it. Just a PSA for other non-bluetooth iPad users out there. Have to admit, I was seriously disappointed to see that this was not available for iPhone. I’m looking into your ticket at the moment, I will get back to you soon. Did you get it to work? Im having exatc same issues, also on ANT+ key and iPad2. No, no update yet. I’ve sent a follow-up email, but remain unable to use Segments at all. I haven’t heard anything. I was hoping Murray would come with some feedback due to his reply from the 26 aug. I must admit though, I have not contacted Wahoo through their own support-channel yet. Yep, I spent some time thinking it didn’t have access to all of Strava’s segments as well. The poke and hope, zoom, then refresh search for segments is pretty frustrating. Some better search and filtering is really needed. Same for the athlete list. Some reductive search there would be nice. Also, I’d love to have access to my Strava Routes. If the routes are comprised of Segments, can’t a large portion of the elevation information be normalized through that? (Although it would only help on routes with a high percentage of individual Segments, which should self-correct as more people ride the grid). Saw a comment about the iPhone too. Limiting the release to the iPad is kind of a bummer. I’d also love to see a Mac desktop version. PS: The KICKR is the best thing to ever happen to indoor training, right next to TrainerRoad and The Sufferfest, so thanks for that. Honestly. 1199$ for kicker plus shipping to Europe plus 49$ wahoo key and now for app additional 15$?? I know customers pay for app development and customers of Kickr are not in millions..but they have already spent 1200$ and more on Wahoo items!!! I would rather buy PerfPro, train hard and segments I will ride outside or wait until either the price drop or strava will have new section for trainer rides. Any idea if Wahoo is working on availability for Android? Based on what I read, KICKR seems to be (one of) the best option(s) out there but I’m not replacing my Galaxy Tab just for that..
And to echo requests from others, I would absolutely LOVE to be able access my rides and routes and repeat them or train for them. And yes, Wahoo Murray, the GPS data may not be exact, but it’s close enough to enjoy. (In my experience, variability is in the +/- 10% range — not something I’d fret over.) If you wanted to gild the lilly, have an “adjust+ and adjust-” buttons in ride mode; maybe this is already possible… I’m a future rider, not a current one! 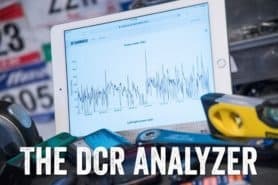 If you utilize the Clever Training DCR Reader discount (see sidebar), you’ll get 10% off all purchases through Clever Training (+ free shipping). 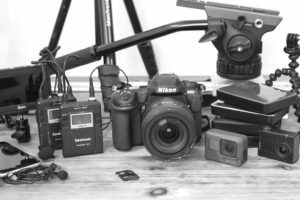 I have links to all products typically at the end of my reviews. I appreciate the support! hello this sounds great that is wht i was waiting for my computrainer.. i realy think if i houd sell mine and by the kickr…. question i understnd that this would not work with my ct but could i use the software with my ct and the powertap i have on my bike? any options on that? For a CompuTrainer, you can actually ride any GPX map you want (which includes ones you can download from your Strava account) with Tour de Giro. It also includes online multiplayer, 3D graphics, and support for your PowerTap. There’s a 2-week free trial that only starts once you ride successfully, so you don’t have to worry about paying for it without trying it first. 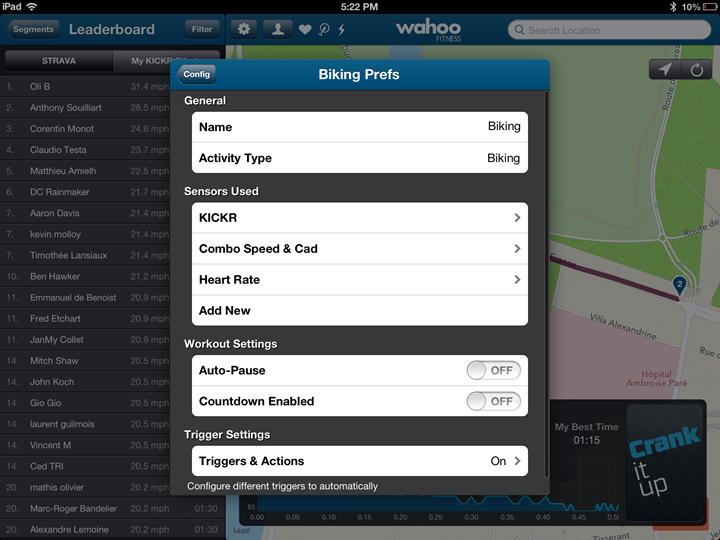 I am very impressed with the Wahoo Kickr, and I am getting one as soon as you write apps for Android. Android 4.3 now supports BTLE, so when will Wahoo support appear? Is there a way to use sufferfest videos and the training data with Wahoo Segments? Was your connectivity issues ever solved? Im also using a iPad2 along with ANT+ key (wahoo). Mine loose connection about every 20-30 seconds. I just had a ride that was extended by almost 50 seconds because it lost connection right at the end. Both KICKR and Key is on newest software as of today. Sounds like you’re doing slightly better than me. I only get a few seconds of connection out of every 30-40 seconds. Hoping the guys at Wahoo are making progress on this, as I purchased another Wahoo product (ANT key) specifically to do this. Terrell i’m glad to hear that, I didn’t even realize you’ve had any such problems. When I’m using my mother-in-laws iPad 3 gen. and connection via Bluetooth, then everything works flawlessly. I also have problems with iPad 2 and brand new Wahoo dongle/key. Connectivity drops frequently (and I hate to lag behind the guy I am chasing), Any news Wahoo Murray?? Any idea why after selecting a segment and pressing “crank it up,” I get to the “countdown from 10” screen but never get past 10? I can see my KICKR wattage being tracked in the greyed-out screen behind the countdown popup. I pedal and pedal, but nothing moves past 10. I successfully linked the KICKR and a Alpha Mio BLE watch to an iPad 3. 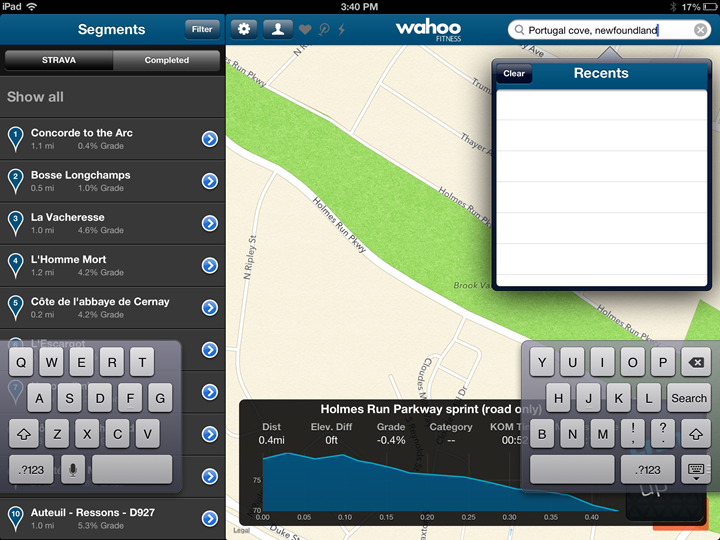 FWIW, Kinomap works on the same iPad — and links to KICKR + the Mio watch. I just realized though that there is not really a leaderboard per se. You race against other Strava rides but you can’t take a KOM or even place against others (I mean, you can’t steal a KOM, even within the trainer racers). I agree it is not fair to take a real world KOM from sitting on a trainer, but it would be A LOT of fun if we had a trainer leaderboard (even seperate from Strava if need be). 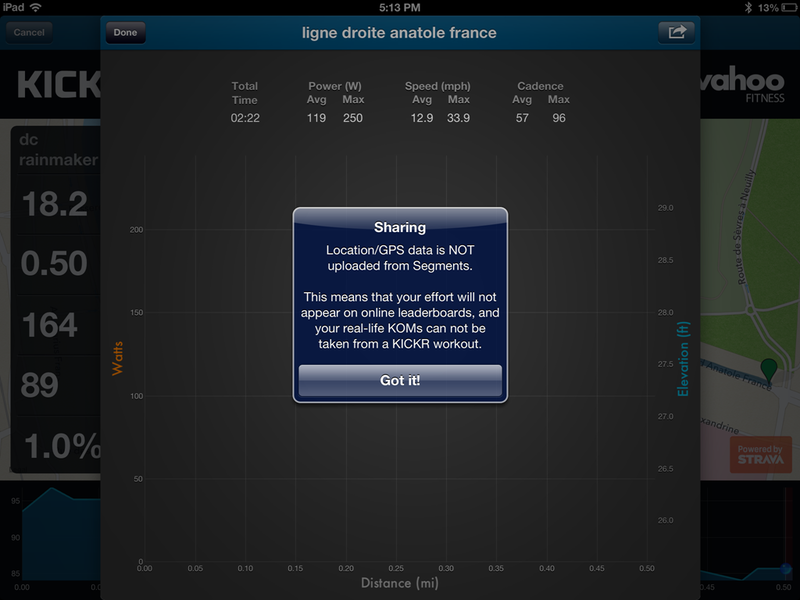 Here, you only steal the KOM from yourself based on your own cache on your own PC. That’s not quite so fun. i am having problems with the segments app. 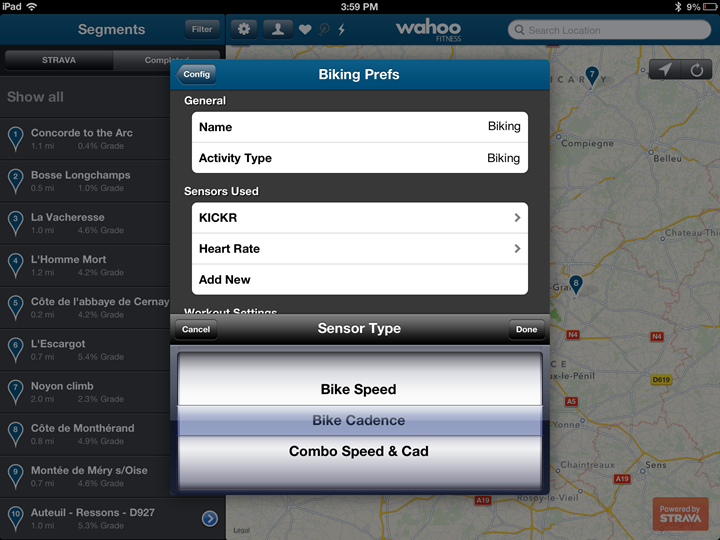 with my configuration (iPad 2, wahoo ant+ key, wahoo ant+ hearth sensor and the kicker) there are quite some interruptions of data transfer leading to empty fields (speed & power) during riding on a segment. hearth rate work fine. what could this be? when I train with the original wahoo app, this does not happen. It is tempting to start naming segments with “#kickr”. This would make searching easier, particularly if the hashtag was used for longer segments (i.e., rides). I don’t want to muck up everyone’s rides with “segments” that equal full length rides, though. Ideally we could pull routes or rides from our accounts. I think you could easily post process the elevation changes and remove drastic grade changes. We are more interested in the general feeling of a simulated ride we know. 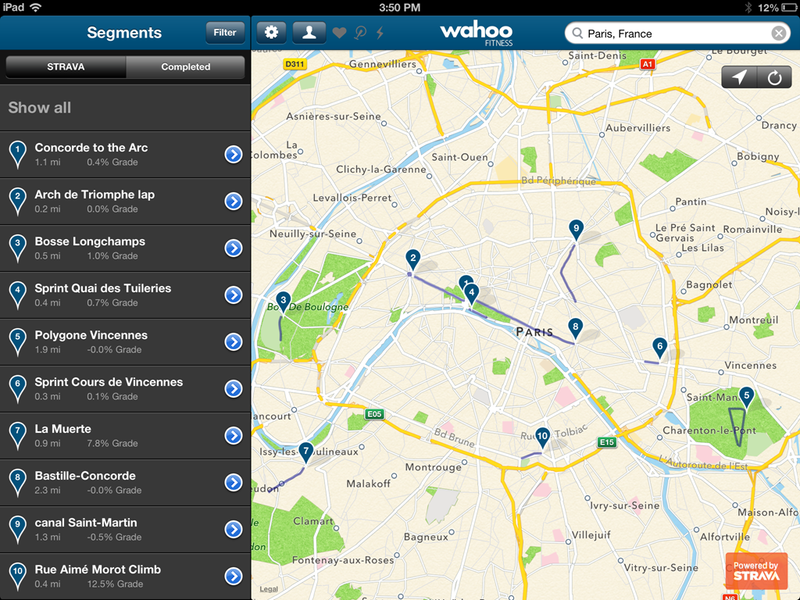 Simply browsing areas for segments and rider density is worth the price of the app by itself. 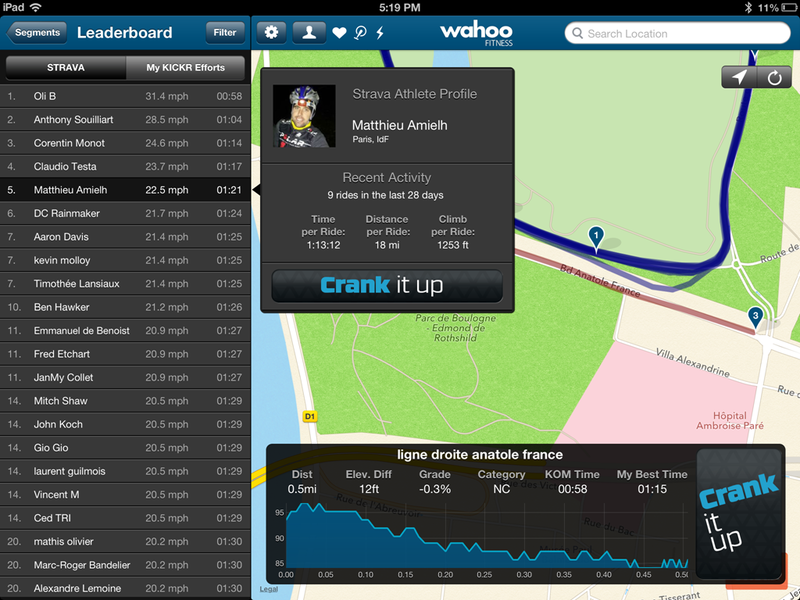 The good: this is a great app to generate some different profiles to ride with a competitive twist. The seriously bad and ugly is the search and filtering is useless. The top 10 segments around me are all to short to be ridden for training. We need a “playlist” that strings together segments into a single ride and perhaps a random ride generator. This latter would be a set of segments that has a specified distance and elevation change. We need to be able to search by segment title and description and not just segment ID. Changing segments should have a pause, or lap, between rides instead of a whole new ride to be uploaded. Great concept and good start. I look forward to new updates. I have another suggestion if you are listening Wahoo. We need a “X-second coast” button added to the app–essentially touch the screen to release the resistance. Having some options for ~10 seconds (need to switch gears when a virtual wall was encountered) to ~30 seconds (need a breather) and perhaps longer would make the app more real-world friendly. I also think you need to run a local smoother on the elevation profiles to clean up the unrealistic elevation changes that exist in the segments. I rode a segment that went from -5% to +18% back to 2% all in about 10 seconds. When something like this happens you can shift gears in anticipation and the kickr locks you down at the high grades. I have a suggestion if Wahoo is out there watching. To make this app a more useful training tool rather that just trying to beat a friend or KOM along a 2 mile segment, now that strava has opened up route creation for all users can we also seach or input route IDs. Currently on the search just segments are found eg: ‘http://app.strava.com/segments/652851’ so input 652851 into seach bar to ride this segment. If we could switch to an explore routes (worldwide) screen to find a route eg: ‘http://app.strava.com/routes/37961’ so then input 37961 on a route explore screen to ride the whole route which should also have the total time of anybody who had also ridden the route to compete against. Once the route has been completed if it could show a summary of all segments passed through like in the real world although none of these would be valid it would just be good to see how well you did as if this KICKR ride had taken place in the real world. Strava haven’t opened the Route API yet, I’ve discussed it with the developers and hopefully should see something next year. I have come across another issue with this app. The default wheel size in app is set at 2.07000 and although there are settings to change this you cannot save them?! I emailed Wahoo asking why I cannot change the default 2.07 to my 2.086 and they replied that because I have no rear wheel I do not need to change this setting and the options to change it will be removed in the next build! The problem I have is because the app believes my wheels are 16mm in circumference less than they actually are I cannot compete against my real world times or even the KOM, to maintain the same speed on the KICKR as I do in the real world my cadence has to be 10+rpm higher and this shows at the end od a KICKR ride. Over 15 miles I end up at least 0.6 of a mile behind! I wouldn’t mind if I were just slower but I am pounding my cadence at 100+ just trying to keep up! where in the real world 85-90 is where I’m at. Any chance Wahoo you could look at this and let me customise my wheel size? KICKR results are not valid anywhere other than to myself so if you think we will cheat by making our wheel sizes larger than they are we will only be cheating ourselves! I just submitted an update this morning that fixes the wheel circumference settings. Should be available next week. If I don’t complete the entire segment can I save it and returned later to finished from the point I stoped. I’m pretty disappointed with this. Paid over $30 for an app which is next to useless as the gradients are incredibly unrealistic and impossible to use for any type of constructive training. Really should be able to get money back and only pay once the current issues are resolved. Sorry you are having issues. Not all segments have corrected elevation profiles and unfortunately I have no way to filter segments that have been corrected. I am working on some new filtering algorithms that should be much better. If you really want a refund you can request this directly through Apple. Wahoo Murray, please make a KICKR specific leader board along the lines of Strava. That would be so much fun if we could race each other virtually and record it. We don’t really have the web services to achieve it yet and the Apple game centre leaderboards a too limiting. Defiantly on the cards for the future. 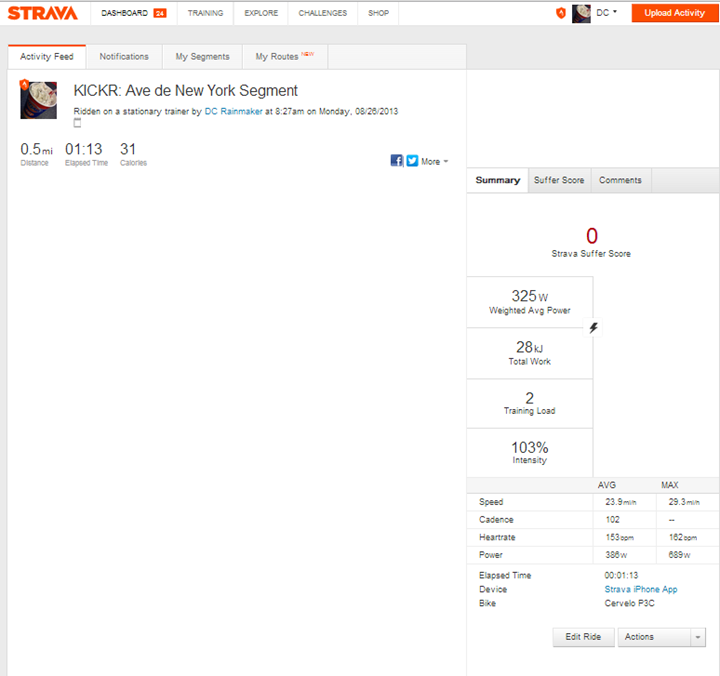 We might even see leaderboards for KICKR directly on Strava. Wouldn’t it be nice to include Street View Hyperlapse functionality within a future version of Segments? Just take a look to the youtube demo. You’ll see how promising this technology could be for software featuring google maps road trips. I want to throw my vote in for either allowing me to ride an entire ride or at the very least have a segment auto repeat. Its a PITA to have to keep fiddling with the iPad. I want to workout not worry about all the electronics. I must admit, I was loving this app but the ball ache of having to create large private segments so that I can do a full ride is starting to grate on me. Also when trying to match my real world times when riding these is almost impossible as you do not gain any benefit when going down hill. I have since discovered VirtualTraining on the Ipad by CycleOps app. You get a 2 week free trial and then $6 a month subscription that £3.99 here in the UK. I feels a little strange at first as speed isn’t actual but calculated from your weight+bike weight and gradient from your power output, took a little getting my head around going down a big hill at 40mph without too much effort but is does compare to real efforts outdoors pretty well (not perfectly) but very close. On top of this you can select full rides anywhere in the world or just upload your own .gpx files and ride those (admittedly the upload has to be done from a computer). Whilst riding you get a google map from above (not street view) but looks rather good, and if the ride has a synced video this can be used instead (awesome) or create your own videos for your own rides :). Also you can select a virtual partner to ride with/against from a list of anyone who has also ridden the route or just against a previous time of your own. This Wahoo app is awesome at doing what it does but just isn’t enough blasting a 1 to 2 mile segment, then having to find another then another and so on, on the plus side it is just a one off payment without having to pay a subscription. That said I will only need some indoor entertainment to keep me riding for 3-4 months (winter) that’s £12-16 per year think I can handle that. Good work Wahoo love the app but not fulfilling what I need over the winter just yet. Kevin – in the Virtualtraining app have you created your own course using google maps (or similar), and ridden that? Was wondering how (un)realistic the gradients were if you tried it that way? Yes I have created several full rides by uploading gpx files of a previous real world rides and to be perfectly honest its pretty good. It isn’t spot on as you can imaging as the routes have to go though some smoothing before being available for indoor riding otherwise the gradients could jump from -10% to 10% within 100yrds due to altitude inaccuracies with your gpx file. After you have smoothed the route you may find the odd climb you are familiar with does not seem as tough as it is in the real world then another small hill may seem a lot tougher but all in all its pretty good. I like to ride my own routes as I know the climbs and what to sort of expect and where I am going then when there is an anomaly that throws me (I am after a workout after all). I don’t feel the boredom set in that make me want to get off mid ride as I now have a route to follow and want to get to the end and possibly beat my best time or my friends who has taken to challenging me. I’ve read the entire chain and the same issues keep coming up. I purchased this app last week and it cost me £20. The most I have ever paid for any app !!! In its curret state it is useless. When are wahoo going to listen to all of this feedback and giv it a serious upgrade. None of my local rides are anywhere close to realistic. The search facility is also awful. I have to input the ride web address to find one of my own rides !!! Why not be able to search the actual name. All in all I want a refund but apple are refusing as the app isn’t faulty. Come on wahoo. Sort it out please ! Sorry you are not Happy with the app and feel like we are not listening. I personally write the Wahoo apps along with another developer and as you can see from the comments I spend a lot of time reading comments on Ray’s posts and try and respond to all issues. I have been in discussions with another company that has spend a lot of time developing some algorithms to smooth GPS elevation data, unfortunately while it might seem a simple smoothing algorithm, its not and required the use of graph theories to get right. Our app currently uses a common GPS smoothing algorithm. Our ability to search segments is limited by the API that is available, searching via name is not currently available and we are working with Strava to get access to this feature. If you still want a refund, just let Apple know that the app does not function as expected and I am sure they will refund the money. I personally just select “I did not mean to purchase this app” when getting refunds. Russ I hope this clears things up and I hope we can provide some updates in the further that will make you happy, I personally take great pride in our Apps and want to provide the best experience possible. I picked up the app recently and have only used it once. I really like what I see and feel riding, but my elevations don’t seem to change enough. It’s not just a little bad smoothing, it’s way off when the elevation changes from 0 to 5 or 6 or 7 %. These are rides I’ve done in Strava using my iPhone 4 and 5. I use Segments on an iPad Air. Am I doing something wrong? I also use Kinomap and those elevation changes seem much more accurate. I want to use Segments for local rides and training. Any suggestions? (2) Accurate representation of uphill and downhill grade – it seems like the uphill grade being emulated is consistently more difficult than the real world experience. For example, riding a real world segment in a gear range of 53×21 to 53×14 that has a grade from -2.0 to +4.0 is not represented correctly – any elevation gain feels close to 2x harder than the real world. Perhaps you can share how the grade is controlling the kickr engine? 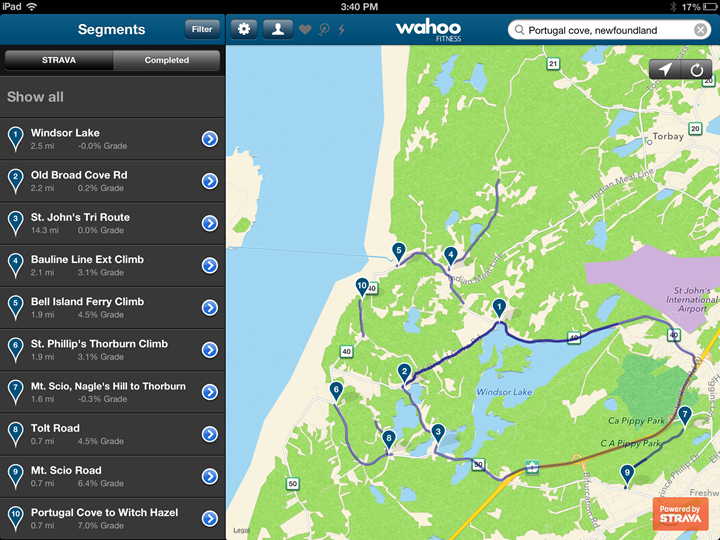 I’m looking right now for an app (and/or online service), where I can create a trip and then ride the elevation profile. Strava segments isn’t too bad, but there I can only ride short segments. Trips, getting up L’Alp d’Huez or Col du Tourmalet or any other trips near my hometown, would be nice. I don’t really need a video (as for example Kinomaps), just the elevation profile would be nice. No reason you can’t do longer segments on our Segments App. Due to a few restrictions in the Strava API, sometimes its easier to search for a segment on a PC and enter the segment ID directly once you find the one you want… normally have lots to choose from. Virtual Training is also another good option. Any chance Segments will eventually be available on the iPhone? Its not very high on our list at the moment, so I don’t think we will have it done any time soon. Thanks Murray. As I have no need for an iPad, I’ll just have to let this feature go. Nor do I have any need for an iPad (I’ve got a 1st Gen that doesn’t have Bluetooth 4.0) I was hoping to throw Segments up onto a wide screen television from my iPhone 5. I bought the kickr (which I love) to specifically ride with Segments, even bought the Segments app to find it didn’t work. Jailbroke my phone to try and emulate the app on my iPhone, but yep, no luck. Still hoping for a solution. Nor do I have any need for an iPad (I’ve got a 1st Gen that doesn’t have Bluetooth 4.0) I was hoping to throw Segments up onto a wide screen television from my iPhone 5. I bought the kickr (which I love) to specifically ride with Segments, even bought the Segments app to find it didn’t work. Tried jb-ing my iPhone to try and emulate the app on my iPhone, but yep, no luck. I don’t have any need for an iPad (I’ve got a 1st Gen that doesn’t have Bluetooth 4.0) I was hoping to throw Segments up onto a wide screen television from my iPhone 5. I bought the kickr (which I love) to specifically ride with Segments, so I bought the year Strava membership coupled to the AUD $31.99 Segments app to find it didn’t work. Tried jb-ing my iPhone to try and emulate the app on my iPhone, but yep, no luck. Still hoping for a solution in the near future. Rainmaker, is the Cleaver discount code reinstated? I thought I read that it was no longer available, and I didn’t see a link in this article, but it was mentioned in this Q&A. Thanks for another great review, I find myself always stopping here as I make my final decisions on new training tools. I know this is a wahoo fitness app for a wahoo fitness device, but is there any possibility that this app can be used with the cycleops powerbeam? No, it does not work with the PowerBeam at this time. Not at the moment, the power beam is a little different to control. We have the details but we just need to find some development time to add it. I sold my computrainer and bought the wahoo kickr from the review. I was tired of dealing with windows on my Mac. I ran segments yesterday, and it seemed fairly accurate on the climb, I.e. I was able to keep up with the racer, even though I was pushing some pretty big gears that I would normally not be able to push in real life on such a climb. At least computrainer had their basic physics modeling right….. Given the design of this specific app is to ride short segments, if you didn’t complete the segment then it wouldn’t make much sense to save the result of that segment against completed segment leaderboards. No? DC, I can see your point. There are short segments but also longer (25-40+ miles segments) within Strava, and sometimes you need to stop short. Who gets on the trainer for a 1.2 mile ride?, I am in for :30 to a couple of hours. Maybe I need to look for a different app. Agree, I do wish the app supported longer rides, allowing you to replicate more than just a short segment. But ultimately, it is what it is in terms of the definitions of segments. Check out both Virtual Trainer (from CycleOps) and KinoMap, which are probably more what you’re looking for. .. And the leaderboard is kind of pointless when the physics modeling is all screwed up and can never match the real life “leader” on a downhill…. I agree completely and have mentioned this earlier in the thread. Segments is great at doing what is does, 1-2 mile hill climb segments and is fairly accurate too since they updated the app so that you can correctly enter your wheels size (even though you don’t have a wheel this needs to match your road bike). I now find that on climbs I can now match my real world times, even destroy them (no wind in segments). If whole rides with downhill physics is what you are after ‘like me’ with the convenience of an iPad app then you cannot go far wrong than with Virtual Training – Cycleops. I’ve checked out Kinomaps, and will take a look at Virtual Trainer. True. Fwiw, the VT app for iPad allows you to create workouts similar to TR (just without some of the more expanded online capabilities). I recently bought the KICKR and am amazed by its many training features, relatively smooth ride and reasonable operating noise. What I did not expect was that with an open system comes lots of choices and decisions- many of which I do not have the time or maybe even knowledge to figure out. For example, I had a friend send me a bike route via Garmin Connect… but apparently I can’t download this route and ride it? Seems like lots of systems, limited communication etc. I am all for open systems, but they do have a cost till they mature? At least Ray helps! you need to create that entire ride as a segment… it’s easier if you have ridden the ride itself first because the create a segment will be at the bottom of the screen somewhere. Move the sliders to increase the amount to the entire ride if you like. Right down the segment number that gets assigned to it because segments app does not search by name very well. 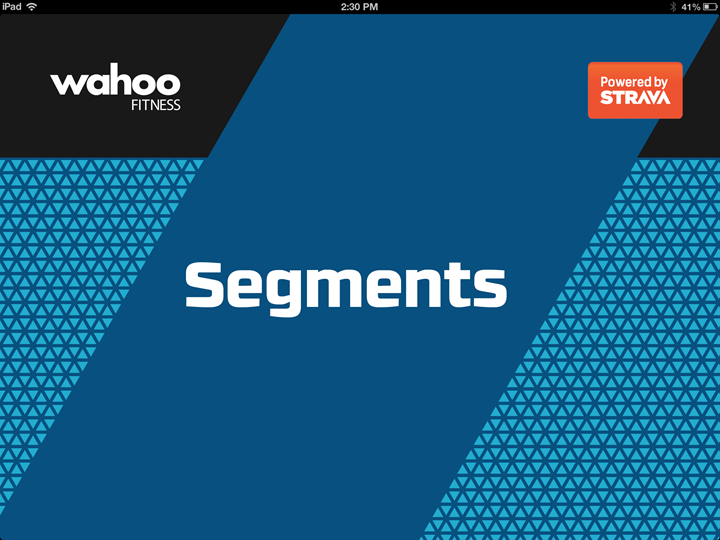 anybody else notice SEGMENTS is way harder then real life and the fitness app itself.. maybe it’s the inconsistency with the grading on segments…?? But 2% on segments feels like 4% in real life. I found the calibration pretty different between the iPad and the iPhone… Calibrated on the iPhone then doing segments on the iPad… I could barely peddle when the slope hits 10%. Recalibrating on the iPad and running segments that same 10% grade felt more normal.. still not quite like outside but closer. I wonder if I can adjust my profile (weight)… would that have any effect ? I assume lowing my weight would make it easier… trying to match the real world.. I think I am close.. maybe 10-15% now. I just downloaded Segments and purchased the KICKR. 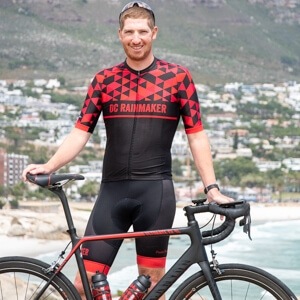 I rode a few of my ‘usual’ segments which have a relatively easy grade – but on the KICKR the ride usually started with no resistance, then suddenly got so had to pedal that I thought I might break my chain. I literally had to stop a few times and reset Segments as it was so hard to pedal that I couldn’t continue. I know this isn’t real life as I ride these segments weekly and the app has them all wrong. What am I missing?? These aren’t even close to real life. 1. did the calibration using my iPad instead of iPhone.. segments is on iPad anyways. 2. Reduce my weight in the profile.. I weigh 185.. set to 160.. seemed more real world on the segments I’ve rode many times. Any update on a new version? Is there a list of changes that are being considered for the next version? I hope to have a new version out before the Tour Down Under, I have a new tab with all the TDU stages and I’ve also been working on improving the elevation profiles. I’m looking forward to it! It’s been like -4,000F here for the past week and the trainer is the best I can do for riding. I have just purchased the kickr, and love using it with kinomaps, and all seems to work fine. 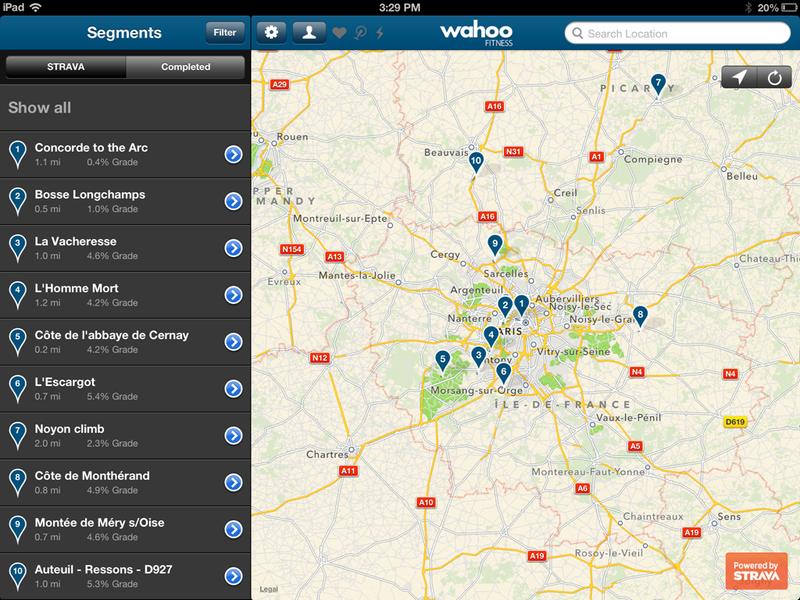 However with the wahoo segments app I appear to to have it working correctly. I have synced the kickr however upon riding a segment there is no change in resistance from the kickr, am I missing something? I love the Kickr, but it really, really needs a simple app for creating workouts or simulating rides and works on a mac or ipad (trainer road doesn’t work on an ipad, virtual trainer is great but requires windows to create routes, kinomaps doesn’t do workouts and is expensive). I was hoping the segments app would work for virtual rides but it hangs on “downloading ghost data” on all the longer segments I have created on strava for that purpose (try segment #6425990). I just checked out segment and the App was using a older API call that seems to no longer update for new Segments. I’m looking at it now and hopefully can post a fix tomorrow. You should try ERG workouts, they are by far the best way to get the most out of your KICKR. Turns out it wasn’t a issue with the API is was due to one of the ID’s getting to large for my formatter! I’ve fixed it and going to push out a new release to Apple today. Thanks as always for the in-depth coverage. Not sure this is the right place for this comment, but anyway here it is. It seems to me that since the algorithms/formulae for working with this stuff are in the public domain, they could be exposed as inputs to the way the Segments app calculates the resistance for the Kickr. If they were, it would be possible for riders to tweak parameters and make the Kickr rides more realistic and comparable to their own real world experiences. One application of this that would be useful (for me anyway) is the simulation of time trial efforts. I’d like to be able to race against my own efforts, but without being able to control these parameters that won’t be possible with any degree of accuracy. A further possibility is if the app was also extended to allow an input of wind speed and direction. For out and back time trials this would provide a way of trying out pacing strategies. We will be exposing more simulation parameters in the future. The KICKR does already support several parameters including road and wind resistance but isn’t exported in Segments. 1) Hitting a virtual wall / unrealistic elevation changes: How about displaying “x meters till y% grade” when riding? The Kinomap Trainer app does this, which makes it possible to prepare (change gear) for the unrealistic grade changes. 2) Elevation smoothing algorithms: I agree that these algorithms may be complicated. However, I cannot see why one couldn’t introduce a simplified algorithm using the elevation value at each 50 or 100 meters, creating a straight line (elevation-wise) between the points. It wouldn’t be accurate, but it would work and it would solve the virtual wall problems. Or am I wrong? Thanks for the suggestions, I have x meters till y scheduled for the next release. While the idea of selecting a elevation value each 50-100 meters is simple, selecting what elevation point is the hard part. I’ve been working with Ryan from BestBikeSplit.com to adjust our algorithm to greatly improve the process. I just released a new version of the app, it should be out in the next hour. Check it out and let me know. If you tap the “elevation” label above the graph you can see the filtered elevation. I still have work to do but I wanted to get a release out for the Tour Down Under. Wanted to thank you for the update. I downloaded it earlier today and rode a 1.5hr segment no issues. I really like the other updates you’ve made, the starred rides is super useful as there are a few regular segments I ride which I have gopro videos for and now you don’t need to remember the segment ids. Also, the new profile smoothing seems to work great. Segments are hard, but no crazy changes in grade. Something like X meters to Y grade would be a nice addition. Other than that, awesome! Anyway – great app, great trainer, great support! Well done on the smoothing. I was one of the first to criticize the orignal release as pretty unusable, so may I be one of the first to say that the new update seems to be excellent. I did Ventoux tonight and whilst the smoothing is considerable, the actual effort required to get from the start to finish is maybe 80% of the real thing, and it’s rideable without any crazy changes. If you were put offf by the initial release and some of the negative feedback, now might be a good time to give it another go. Keep up the good work. Hopefully we can improve it even more with some more work and Ryan at BestBikeSplit.com has been a great help. I’m of a different opinion to Michael, I think what you have done with the smoothing has ruined this app! Before I was quiet impressed with the app and its only shortfall was the length of the segments not making it a good option for indoor riding. But I have since taking to riding some of the big hills in the UK and have noticed something about your smoothing. It appears now once a route is smoothed that the elevation profile is just a series of straight lines with no undulation that you would expect on a real hill, I’ll give you and example…. If you look at the profile of this climb on the Strava site you can see many gradient differences some of which you expect to be smoothed but if you look at it within the Wahoo Segments app this climb is made up of about 9 straight lines. ie: between 2.5miles to 4 miles is just one line constant 5.1% gradient when it clearly isn’t! Now this climb feels totally unrealistic. On the other hand I think you have access to Virtual Training I recreated this climb on there and called it ‘Horse Shoe Pass’ I also had to smooth this rides profile before uploading and it feels totally real, the gradient constantly changes as you climb. I challenge to try both rides and feed back to me what you find. Is there any advance on this? I don’t have Strava and would like to ride previous rides of mine that exist on Garmin Connect? Segments has never worked for me. I load up a classic segment and no matter what the grade is the resistance is very low and is the same for the entire segment on every classic segment i pick. I try to ride local segments and as soon as i hit an significant grade sometimes it becomes nearly impossible to pedal and my kicker starts clicking. video of the clicking. I have the current wahoo segments 1.20 and weigh 220. Hi I have found the same when I have the cadence enabled. for some reason the app will not control the kickr is the cadence pod is enable. disable the sensor in the app, restart the app and try a segment. its works but then theres no cadence. but its better than what it was. also id like to add the clicking in the video starts when i reach 50-55% resistance while using the wahoo fitness app. see the link below post No #617 or the other link for a video of how to correct it. thanks so much!! i really appreciated it..
Another $30? So you buy the trainer, then the adapter for the 142 hubs. Then a “key” form the ipad. And they don’t give you the app? Can you tell me how to work Strava segments from the iMac? Or do you need an iPad? I just completed my first segment on this app. I did a ride in southern France I did a couple of years ago on the road (col Babaou). Now, despite being a better cyclist than I was then I managed to be KOM and complete the 3.5 mile segment in 10 minutes on the Kickr when it took me 35 minutes in reality back then. I feel the resistance may not be quite realistic enough just yet. I’m happy to put in a $50 donation to begin work on a Segments app for iPhone. frustrated about havingto give up my strava account and subscribe to kinomap just for this feature. Did the Segments app disappear from the app store? I just downloaded this app yesterday on my phone and ipad (used the iphone version on my ipad). I have it connected to my Garmin and my KICKR is showing up as a linked sensor. I’ve gone on to my Strava profile, upgraded to a premium account and created a segment/workout. Can someone please explain to me how I get this app to work with my Wahoo KICKR??? It isn’t clear at all and I’m ready to dump all of this and go do a different virtual training program. I’ve searched the Strava website and discussion boards with no luck. I’m not making any rain…just trying to survive through it and want to get on my bike and ride. Any new on when (or if) Wahoo will re-release the app? Why are Wahoo so quiet on what is happening with the app? I received my kickr just after the app was removed and am still waiting for it to be re-released! Coming back from a serious injury and being off the bike for so long i would love to be able to start riding the courses i used to do and train in familiar areas. Its just annoying wahoo have said almost nothing and not responding about the app. Even after emailing them they said, we are working on the problem. I asked if they could publicly announce what is happening to stop people sitting in the dark but havent heard back. I didn’t realise we were coming access as being quite about the app. 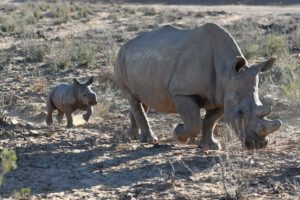 Our support team has been letting everyone know we are working on it and we have published it several times on social media. iOS 7.1 (not iOS 7.0) exposed a critical bug in our app that made it impossible to pair new sensors. The fix only took seconds but the App was developed with iOS 6 SDK and Apple is no longer accepting apps using that iOS version. In order for us to publish the fix the app needs to be updated to iOS 7. This is no easy task. Our team can’t give a date as we just don’t know. When we have finished the re-development and have it submitted to Apple we will let everyone know. If you would like to help, send us a email and join our beta team. beta at wahoofitness com. Thank you graham for the update and clarification! Makes sense and am very happy with the response, i know technology doesnt always work as intended, so all i was looking for is what you just provided in your answer! I have also emailed support putting my name down for if there is any need for beta testers. Thanks heaps mate, your response is greatly appreciated! I see on ITunes that on June 13th (yesterday, that is), the 1.3.0 version of the Segments app was published. The version history of the app says that it has support for iOS 7. On the other hand, you say here in this blog that iOS ver.7.1 introduced the bug which made you to temporarily un-publish the Segments app from iTunes. Is there a way to adjust the wattage on these rides based on your own threshold wattage? Or do you have to ride the ride EXACTLY as it is in Strava? Sorry but I need this spelling out for me if somebody wouldn’t mind, I have just purchased Kickr and ant+ usb for computer, I want to ride classic routes complete such as Alpe d’Huez, Ironman Lanza and Wales or tour de France stages etc, can this be done and what is best app to use? Thank you, I have found it a little frustrating to get started as I really don’t understand the technology, that is not an equipment issue its my knowledge and understanding. 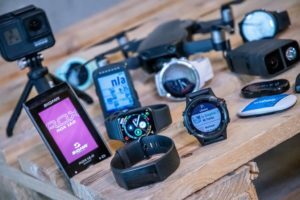 Which app would you use to replicate Ironman 70.3 Vegas in the kickr? Does the KICKR have to be in SIM mode to simulate variations in elevation (ascent/descent)? Thanks. From my own experience of this software using a ipad mini retina and ios 7.1.2…….don’t buy it because it doesn’t work, like most software these days it’s untested, we are the testers. 1. You have to repeatedly (every time you use it) re-pair the s/w with Kickr and Tickr. When you forget to check this you can be several miles into the segment when you realise it’s all too easy……any inclines are not being translated to an increase in resistance from Kickr……so as you will have been giving it your all because that’s the whole point of the app, that’ll be another session screwed…thanks Wahoo!! 2. EVERY Strava user shows up on EVERY segment as zero activity in last 28 days. From the screenshots on the review here you clearly didn’t have same problems as myself as on the Paris segment the ride data for “Matthieu Amielh” in last 28 days is clearly shown, on my ipad that would all be zero or blank. It looks like you’re using a full size ipad so whether this is just an issue with ipad mini or mini with retina I don’t know, but Wahoo must know now as the support feller (Tyler) said (9th July 2014) “I do see what you’re referring to. I will pass that along to our app developers to take a look into”. In which case surely Wahoo should be warning any ipad mini/retina owners off buying “Segments”, that would be the correct thing to do wouldn’t it?…….oh…..but that would affect their revenue….silly me. 3. Segments cannot be found, even when zooming right in on map. 4. Very few segments can be found using the segment number from Strava. 6. Gradient % data is so way-off it makes challenging some segments complete nonsense. ie one of my own segments in real life there is a gradient of 3% but in “segments” it’s 6.5%, how could you possibly compete with that level of inaccuracy?…..you can’t! !….I’ve read on various sites that this problem is due to the algorithms that Wahoo use….well that’s above my head, all I know is….IT DOESN’T WORK!!!! I tried to talk to support at Wahoo, we exchanged 3 emails and each time I was asked what device and what version of ios I was using…I must admit to be not being the most patient of people, so I gave up. Having to wait 3 days for a reply then be asked repeat info just wound me up. And just to clarify, this was a new ipad with no other apps installed as I had to buy a new one that would run ios 6/7. So…. £900 for Kickr, £400 for ipad……£22 for segments…….I could’ve bought those Zipp 202’s. Oh….I was forgetting when I bought the Kickr, I stupidly spent another £70 on the Wahoo Balance…..you guessed it……that doesn’t work correctly either. I won’t bore you now with details….but I will say that after I bought it I noticed there were 2 on ebay, one with a starting bid of £10……it didn’t get any bids!! !, obviously everyone else is in the know……mug or what??? I bought and downloaded the Segments app recently and found it to be very buggy. I could not locate any segments by panning and zooming and had to manually search by name for the segments. Furthermore, when I select the segment and start the Crank it Up, the count down timer just stays at 10 seconds and never starts, no matter how fast I pedal. I could not find a way to reset this app and deleted it and tried downloading it again. I would not recommend this app until they fix all the bugs. Hi Guys, just purchase the kickr and keen on the segments app.. do you know if this can be used on the PC as I generally do all my riding online via Trainer Road. wishing to use some rides I’ve done to improve for next year so being able to use PC means no additional cost for ANT+ dongles or Wahoo Heart Strap to link it all together. No, the Wahoo Segements app is only available on iOS. Bought the Kickr this week and tried it out and had no dramas. I found you have to make sure it’s reading the Kickr senses Scott Lum cos I had that problem but then sorted that drama out. I have noticed the app maker on here so I would like to make two recommendations as a coach who prepares people to race overseas…. Can you make it applicable to use with something like Google Maps so we can build rides into it that don’t exist and obviously make the segments as long as we would like them to be (like 180km 🙂 ) I was happy to pay the $$$ though for a product like this. Hi, I am having an issue with Segments. Every time I tried to upload the data from a workout to Garmin Connect I got the message: “A server error occurred while uploading workout data”. Strava uploading has no issues. Any thoughts ? Yeah its been doing it for a couple of months, I think it was when garmin started charging. We are trying to keep things working but Garmin has pulled support for 3rd party uploads so it s bit of cat and mouse, it might get to a point that we can no longer have Garmin uploads. Hi, I recently bought the kickr and use it where I do not have internet, nor will I be able to get internet where I use it. My question is can Segments be used offline once downloading the segment? It’s not really designed to work offline, although once the segment is on the workout page and ready to start then its fine to take it off line. Just wait until it tell you to start peddling. Anything new coming to the Segments app? I tried my first ride on it today, a local 33k segment. I was using an IPAD3, Kickr and Tickr. Everything worked nicely…. but the route is slightly rolling, hills of between 3 and 5% every now and then, but I felt no resistance changes. 190w brought me about 30kph regardless of whether the segment profile was showing me going up or down a hill. Will try a couple of different segments in the next few days. Anyone else encounter this sort of thing ? Are there Ironman type of rides on segments? I see them on Strava.com but on the app i can’t seem to find them. Advice? If you an find it in the app, you can enter the segment ID directly into the search bar. I did not see any US routes. 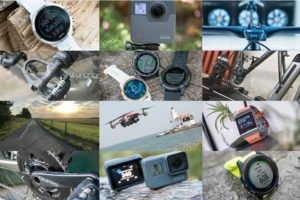 Any way to get rides from Garmin to APP? I’m on the fence about buying the Wahoo Kickr because it seems like a lot of people are having problems getting the Apps to work with it. 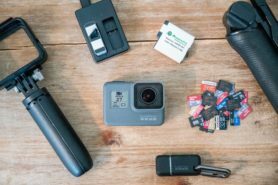 I only have windows systems to use, so my main question is this: What is the best App to use with the Kickr if you want to import rides to get the most realistic indoor/outdoor ride? I’ve been using TrainerRoad (Great App) but I want to ride some courses that you can import, rides you have rode outside. I want to be able to train on some courses. You’re looking at someone who cannot get either the Segments app or the Utility app to function properly. They work in parts, but cannot get Segments app past the count down screen to ride a segment and the Utility app doesn’t seem to want to recognise my iPad is connected to Wifi. Very frustrated. To the point of returning the unit. Just found this review, which is odd because I frequently read here think I read the kickr review 20 times before deciding to buy it! Really wish Wahoo would provide better support for Android. 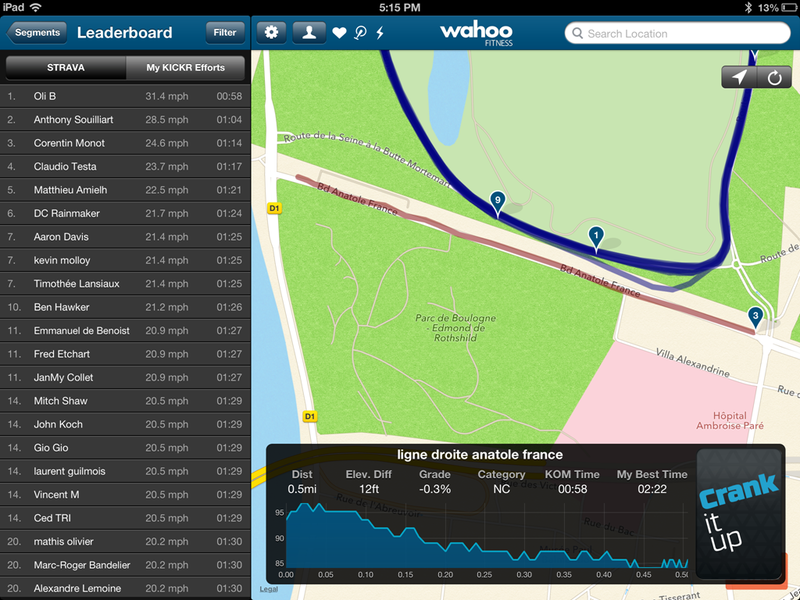 The Kickr is amazing but the Wahoo fitness app is severley lacking / buggy on Android and why No Strava Segments? Android is a massive portion of the market yet so many developers overlook it. Loving the Kickr and Segments App, mostly for their interoperability and simplicity. But, having said that, I can’t seem to find out how to get elevation data to show up on my Strava segments. Am I missing something? Segments captures speed, distance, and elevation (%) in real time, but I can’t get the total elevation of the segment I just rode at the end posted to my Strava page…weird. Am I missing something? At this stage Strava doesn’t support us uploading the elevation data since the ride is indoors, although they are in the process of making changes so we can upload both Elevation and even the Map. Once they have rolled out the changes we will be working on an update to the Segments app. As Strava introduced the “Virtual Ride” type, when will you update the app to support this? I’m waiting for this as the key feature before buying the app. 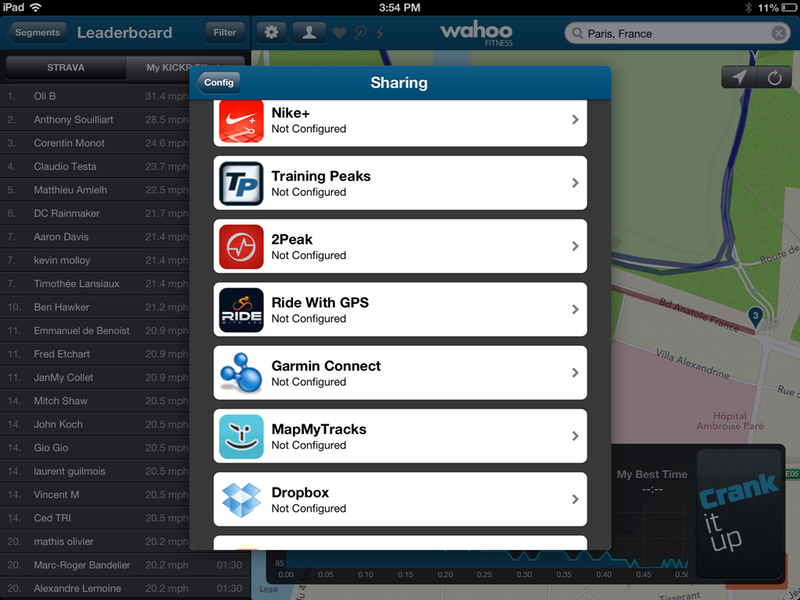 I actually just posted an update to Apple for review adds support for uploading Virtual Rides to Strava! It also includes some fixes for iOS 9 and a couple other UI issues. so when are we android users going to be able to enjoy this? why is wahoo so IOS heavy?!?!?! We don’t currently have any plans in porting Segments to Android although we do have lots of plans for other Android apps in the next 12 months. Why is Wahoo so iOS heavy? Its a historical answer, iOS was the first platform that allowed us to use ANT+ (about 5 years before Android) and was also the first platform with Bluetooth LE (about 4 years before the 1st Android device). As a result until this year, all of our customers had iOS devices since you just couldn’t connect to the same sensors on most Android devices. This is changing and so are we. I am interested in the Segments app but can’t find it. It is not available in Canada for the iPad? Wahoo have removed the app from the app store due to problems. I’ve been attempting to add ‘starred segments’ to my Segments app list of Strava Segments and apparently the link between my Strava account and the Segments app is no longer working (??) I’ve logged in and logged out, I’ve deleted the Segments app and re-downloaded it…all with no result. I’ve tried to download a fresh copy vs. downloading from my “purchased” list within the app store and the Segments app appears to not even be available anymore. I’m extremely disappointed as this app wasn’t cheap at $30. Does anyone have a working copy of this app on their iPad? For the ‘Starred Segments’ that do transfer over to the app, many of them simply crash when I attempt to ride them. I also have this app on my iPad (mini) and it works. I agree that for this price, Wahoo Fitness should have done more. I am looking forward to seeing what the updates to this app will bring. Just to confirm, the Segments app is only available on the iPad? Hi, I have the Wahoo kick which also came with a Wahoo cadence thing for the pedal. 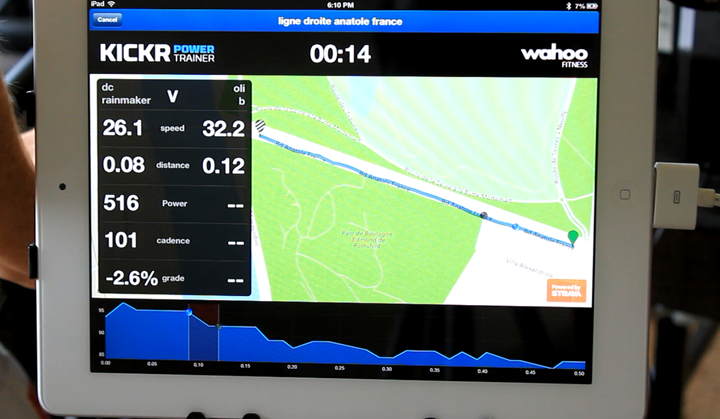 All works great on apps like Swift and Fulgaz, but when I use the Wahoo app Segments , the app only controls the trainer if I disable the cadence thing. For some reason the Segment app only seethe cadence as “speed and Cadence” and not just cadence. and so if its enabled it doesn’t control the kickr. As soon as Disable the and restart the app then all is good but I then I have no cadence. there’s nothin in the app to let me tell the app usr the speed from the kicker. any views or is the a cadence thingy that works with it? Sadly Wahoo has pulled this app from the App Store. … How do we get it downloaded from outside the USA. Locked as far as South African iTunes are concerned. Anyone know someone that can pull some strings. Love your work – very helpful on a number of things I have wanted the answer/facts to make a decision. Agree with the Wahoo Kickr gap with being able to ride a course you select/have ridden. When read your stuff on Segments – I was in and purchased an i-pad… For some reason the App is not (no longer) available in Australia! Do you know anything about if this is going to change or if there is a way around it. Unfortunately I don’t see them returning to it. Though, Kinomap introduced similar functionality last summer. I take it this app is dead? Is there anything out there like it? I’m trying to find something to build a Kickr workout from Strava routes. For those of us who paid money for this app, are the developers prepared to refund given that they’re not fulfilling their obligation of providing a product that works any longer. Still, I suspect you could request a refund since Wahoo themselves noted to do so if you found the app no longer works for you.